The above verse seems to indirectly say that all the 3 Vedanta philosophies- Advaita, Vishishtadvaita & Dvaita are all valid philosophies. Which scripture contains the above verse? Jai Shri Rama! Jai Bajrangbali! Hare Krishna! Jai Sriman Narayana! Initially I guessed this should be from Muktika Upanishad or Adhyatma Ramayana texts like Rama Hridayam or Rama Gita but those parts don't contain this verse. Thus, Shri.Lingamurthy Garu composed a magnus opus called “sItArAmAnjanEya-samvAda”. A beautiful work and gloss on “rAma-hridaya” which culminates in universal vision of advaita. This was said to be composed in 1760 AD. The following are the last verses. After imparting the Upanishad vidya to Shri Anjaneya, Lord ramachandra asks shri Anjaneya whether He had understood the teaching properly or not. I searched for the work sItArAmAnjanEya-samvAda but it seems in Telugu language, so, I can't check it. By seeing the nature of Guha Gita, it seems verses are mainly taken from different scriptures. So, others sources are needs to be checked. Some claims this seems from Adi Shankaracharya's Hanuman Pancharatna Stotram but I couldn't find in it except this HanumanSukti. Hanumat Sukti is one portion of the book Sukti Sudhagar by Gitapress. You can view/get book from Internet Archive : Hindi Book Sukti Sudhakar By Gita Press . 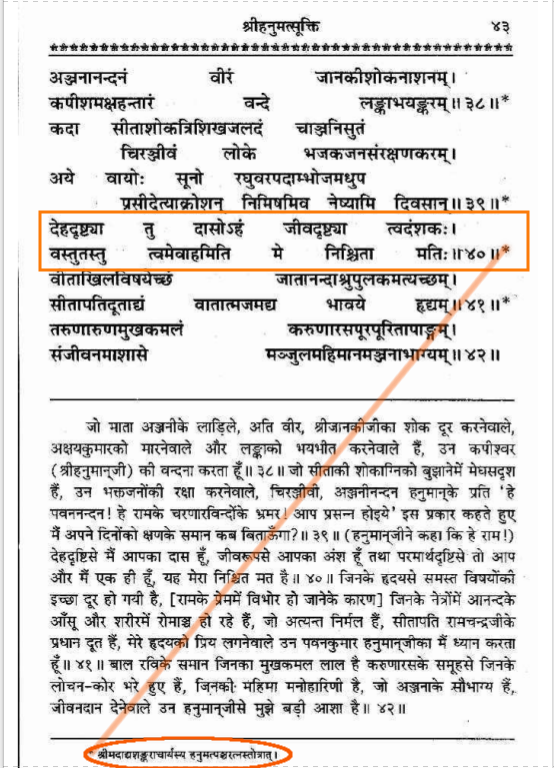 However, let me clear that Adi Shankaracharya's Hanumat Pancharatnam doesn't contain it. This may be case or wrong/missing reference I think. Not the answer you're looking for? Browse other questions tagged rama hanuman identification-request .